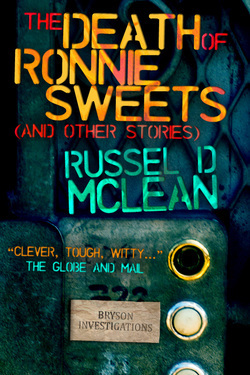 Before he introduced the world to Scottish Private Investigator J McNee, award-nominated crime writer Russel D McLean wrote a series of gritty short stories featuring PI Sam Bryson, a young investigator with a strong sense of justice that is tested to the limit as he walks the mean streets of Scotland's fourth largest city. The Death of Ronnie Sweets collects all the original Sam Bryson stories in one volume, with an introduction by award-winning US author Sean Chercover and an afterword by the author. With an exclusive introduction by Sean Chercover ("Big City, Bad Blood", "The Trinity Game"
"I was expecting a lot of blood and ruptures in this book, and I wasn’t disappointed, but there’s an emotional element here which is missing from a lot of gritty crime fiction. Mclean has a keen eye for human frailty and every story has a deep undertow." "Individually the nine stories are great reads. Collectively they bring to life a deeply satisfying character I wouldn’t mind seeing get a chance to shine in a full length work…"